When I was given the opportunity to meet the leader and some key members of a well-known gang recently, I must admit to a degree or two of trepidation. After all, the term ‘gang culture’ seems to constantly be in the news these days and I knew this particular gang had quite a reputation! Colleagues did nothing to allay my concerns, coming out with comments like, ‘wrong side of the tracks’, ‘hard as nails’, ‘know how to handle a tool or two’, ‘off the rails’ and ‘prepared to get their hands dirty’. “Bore da Tony, I’m Dafydd Thomas, leader of the Black Hand Gang, fancy a panad”?! Moments later I was sipping a freshly-brewed cuppa, made with ingredients taken from the large box I had seen being carried earlier, which turned out to be the best organised tea box you could imagine, containing at least two kettles, teapots, proper china mugs, tea, coffee, fresh milk and a good selection of biscuits! Settling down on my upturned box, I listened to Dafydd as he explained all about the gang culture that was rife within the Ffestiniog & Welsh Highland Railways. Five minutes later Dafydd was still going. So, for the purposes of this blog, let’s just say there are a lot of gangs working for the FF&WHR, all beavering away for the benefit of the Railway and those that travel on it…….and that is my point. We have been conditioned by the media over the years so that whenever we hear the word ‘gang’ or the term ‘gang culture’, we immediately think the worst, when in fact there are thousands of gangs across the UK, all doing positive things and all working for the greater good. All the gangs working on the FF&WHR are just people who want to offer up the skills they have, for free (all gang members are volunteers), to a cause they believe in, so that others can benefit from their labours. They also have a great social time in the process. Gangs are made up of people from all backgrounds and include, amongst their members, captains of industry, life-long engineers, students, painters and actors. Dafydd Thomas has a background in the theatre. 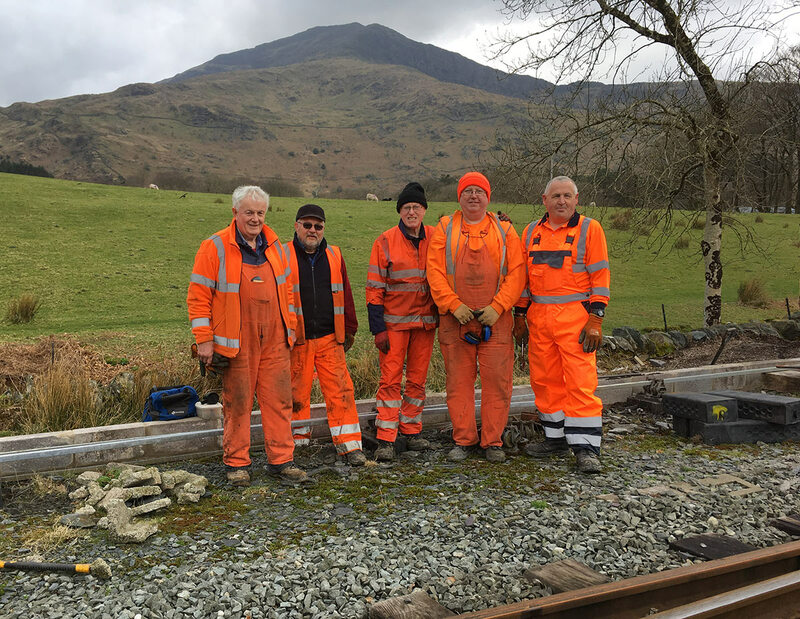 Wanting to do something completely different, he started work for the FF&WHR in 1994, helping to strip down ex-Channel Tunnel construction sleepers in readiness for a new life on the Welsh Highland Railway, which was in the process of being restored at the time. The Black Hand Gang first came together in 1995 to help lay the track of the new WHR. Their gang name evolved later, around 1998 and came from the very sticky black grease that was used to lubricate fish-plates (metal bars bolted to the ends of two rails to join them together) whilst laying the track. The grease got everywhere and was difficult to wash off hands. Currently there are around 40 members of the BHG, with roughly 50% being Welsh speakers. Most live within 25 miles of the railway, although some are from further afield in the UK, as well as from Germany and the USA! They come together to work on the railway every other weekend, with an average gang size of about 8 – 10, although sometimes the turnout may be up to 20. Over the years they have worked on just about every section of the Welsh Highland Railway, as well as parts of the Ffestiniog Railway. Memorable jobs include laying the very first rails of the revived WHR at Dinas and the very last rails at the point where it joins the Ffestiniog railway in Porthmadog. They have also worked on the much-photographed Bryn y Felin bridge near Beddgelert and spent several months laying track in the 280-metre-long tunnel in the Aberglaslyn Pass. Which, according to Dafydd ‘was damp, but not as wet as the rain outside’. Perhaps the most memorable job of all was putting in the ‘Golden Bolt’ in the very last section of the WHR on its completion. This ceremonial ‘signing off’ of a job well done, took place in the dark, using wind-up torches for illumination, at 7.00pm on 27th February 2009. Something never to be forgotten I’m sure, but in Dafydd’s own words, “The most memorable thing of all about the whole WHR project, apart from getting the job done and done well, is all the new friends we have made along the way and the fun we have had doing it”. So, the next time you travel on the Ffestiniog and Welsh Highland Railways, spare a thought for all the volunteers that have worked (and still work) tirelessly to enable you to do so; and if you see a gang loitering on the track at the end of the platform, go up and shake their hands, after all what’s the worst that can happen? You may end up with a bit of grease on your hand, but I promise you it will be an enriching experience all the same.